LinkedIn is currently the fourth most popular social media platform in terms of monthly visits. If you’ve never used it before, LinkedIn is a bit like the Facebook of the business world, allowing you to connect with colleagues and create business networks in the digital world. LinkedIn is especially powerful as a social media platform for businesses who sell products or services to other businesses. 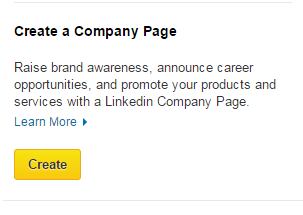 LinkedIn is like the new digital resume/portfolio. Having a well maintained and updated LinkedIn profile is one of the best ways to build your business and personal brand credibility. The things you put on LinkedIn showcase who you are as a professional. 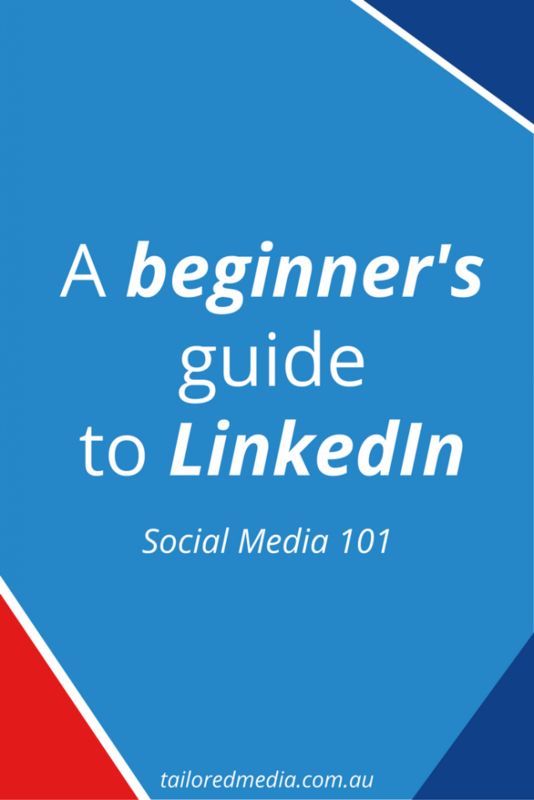 What do I need to know before I get started on LinkedIn? Start to network with people as soon as possible. Send connection requests to people you have worked with and as you would at any industry networking event, get yourself out there! 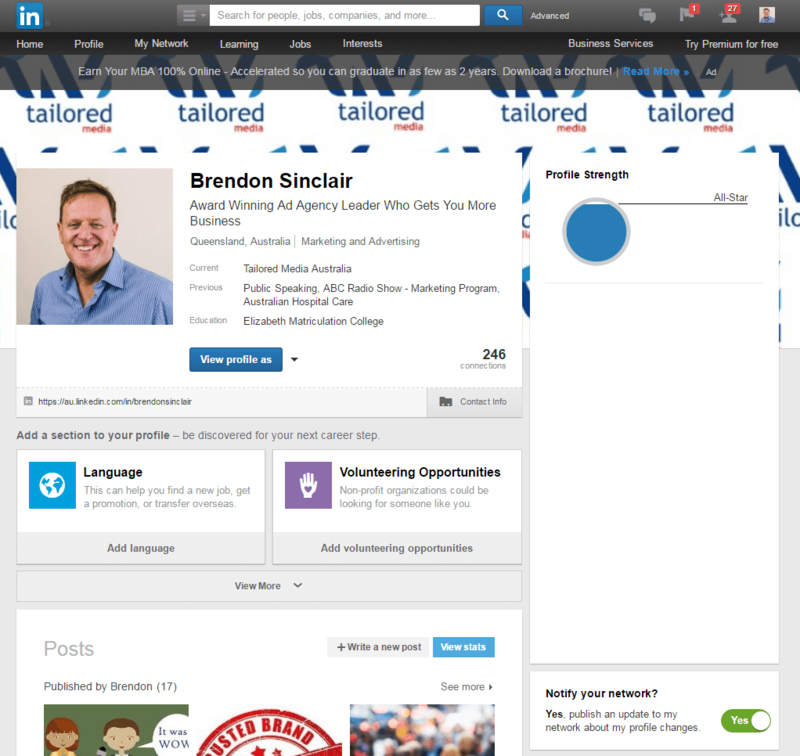 Brendon is a great example of a LinkedIn page that has been filled out well. He has a tonne of experience listed and he has used an attention-grabbing headline. 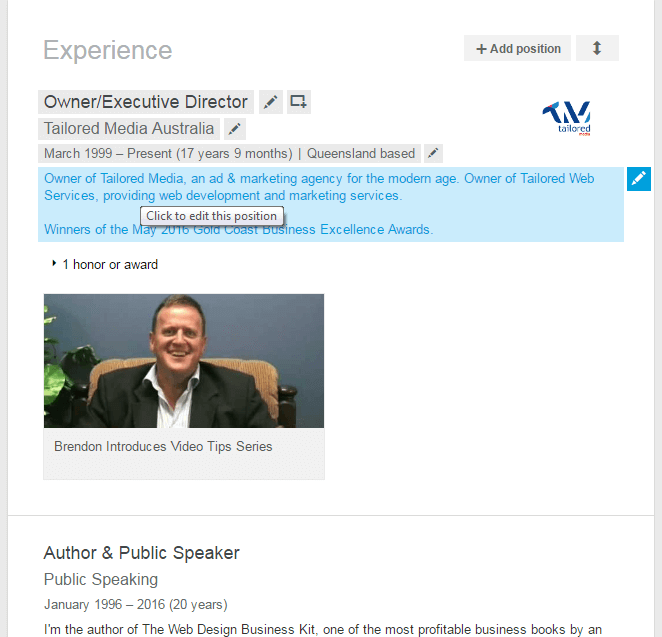 When people see Brendon pop up on LinkedIn, “Award Winning Ad Agency Leader Who Gets You More Business” is the first thing they will see. Sounds a lot better than “Owner of Tailored Media” doesn’t it? This is your chance to showcase your personal brand. Editing your profile on LinkedIn is easy. They are always asking you to keep your profile updated and if there is ever anything you want to edit, simply hover your mouse over it and a little edit icon will pop up. Your home feed is a collection of posts and updates from the people and business that you follow. To make the most of LinkedIn, it’s a great idea to have a bit of a scroll through here every now and then and spend some time interacting with the relevant content that pops up. You can interact with content by “liking” or commenting on it. You can check out our posts on Facebook and Instagram to give yourself a better idea about what these two actions are if you’re unsure. How do I talk to someone on LinkedIn? Like most other social media platforms, you can communicate with people both publicly (by commenting on their posts) and privately. To message someone privately, you can select the inbox from the top right hand corner of the top menu bar. 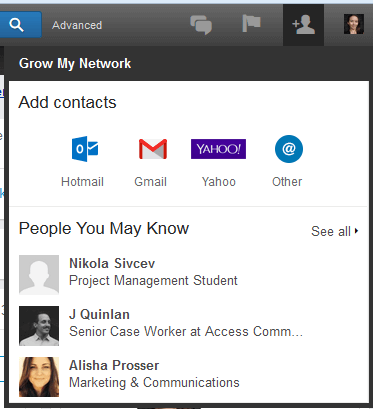 If you are using a free version of LinkedIn, you will only be able to send and receive messages from people who are listed as one of your connections. If you upgrade to the premium version of LinkedIn, you will be able to make your profile an “Open Profile” which means anyone can message you, regardless of whether or not they are connected to you. Share a photo. Perhaps you have been to an industry event or won an award – show the business world! Write an article. This is kind of like writing a blog post. While it’s a great idea to write and share articles on LinkedIn to position yourself as a leader in your industry, don’t neglect posting content directly to your own blog. Generally speaking, to get your content in front of people, they would need to be connected with you. You can connect with people by either searching for them in the search bar at the top of the page, or by bulk-adding contacts from your email account. you can do that by hovering over the connections notification button at the top of the page and navigating down to the ‘Add Contacts” section and following the prompts. Should I be using Facebook for my business? This link will take you to a feed of all of the content from companies that you follow. To create your own, you will need to navigate to this section on the right hand side of the page. You will then be asked to fill in the company name and provide your email address at the company. Your email address will need to have a domain name that matches the company name. For example, if we were setting up Tailored Media, we would have to use an email that is example@tailored.com.au, we couldn’t use tailoredmedia@gmail.com. You will then be sent an email asking you to verify the email and then you will have the option to enter in your business details. Once all of your business details are filled out and you have uploaded a profile picture, you can start sharing content and connecting with employees. You can update any business information using the blue edit button in the top right hand corner of the page. 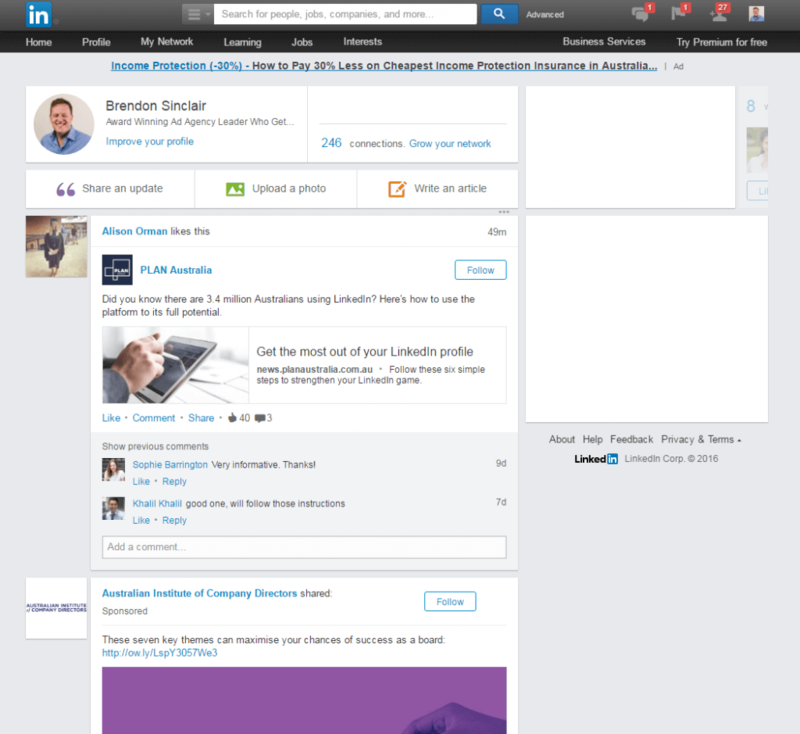 The best way to make your business look good on LinkedIn? Share content that adds value. LinkedIn is the place to overwhelm potential customers with information relevant to your industry. Have you found a valuable statistic? Did you come across an article that your ideal customer needs to read? Have you written something that should be shared? Now is the time to speak up! Posting regular, quality content to LinkedIn will start generating connections, interaction and potentially, genuine leads for your business. Which is more important ? Your personal or company profile? Both. It’s extremely important to keep your personal and company profiles active. If you have staff at your business, encourage them to update their personal LinkedIn profiles and connect with your company too! 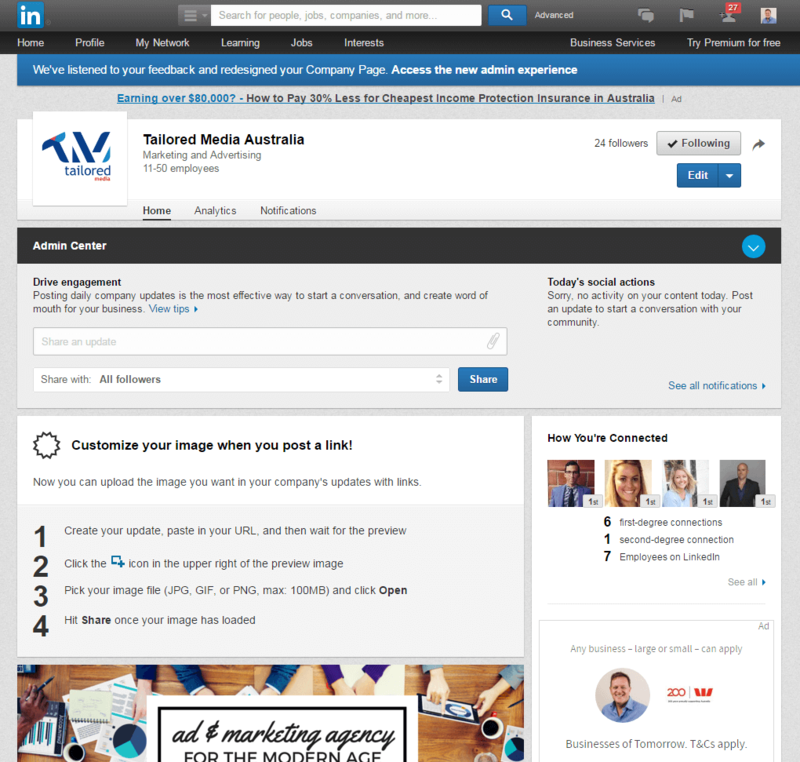 Having your staff actively using LinkedIn helps to increase the visibility of your brand. According to LinkedIn, employees are 70% more likely to engage with your company updates than other users, and once they interact with your content, their connections will see it. Your employees are also your most powerful brand ambassadors. If their personal profiles are showing off how incredibly awesome they are, why wouldn’t potential clients want to work with you? Having your employees active on LinkedIn makes your business more human. What you do becomes less about the business and more about the people who make up the business. People buy from people. So far we have covered Facebook, Instagram and Twitter. While this blog series is stopping here, there is still so much that we haven’t covered. What we have talked about though, is enough to get your business started on social media. The four social media platforms we have covered so far are some of the biggest platforms out there, giving you potentially the greatest reach possible. There are a number of other platforms out there, however, that could be extremely beneficial for specific niches. I’m not going to cover them here because there is a huge risk of it causing overwhelm. It can be extremely tempting to put your business out there on every social media platform possible but the best advice I can give you (truly) is DON’T. There are not enough hours in the day to develop content and post consistently to 10 different accounts. All you will be doing is diluting your brand and producing content that fails to showcase the best side of your business. You are better off choosing one or two social media platforms and putting some extra effort in to make sure you are doing them well. Stay tuned to the Tailored Media blog in the future for more updates on social media marketing and other aspects of branding.